NEW for 2017: Discussion about the www.TestUFO.com Blur Busters Motion Tests. Widely used by enthusiasts, display tweakers, reviewers, monitor manufacturers and VR headset makers! ycc wrote: I just discovered this site and it's cool! I have written tiny tests like these for internal use before but definitely not as systematic as this. One suggestions for the frame rate scrolling tests like "UFO", "Vertical Scrolling", and "Marquee": The logic seems to round the coordinates for the text to be integer coordinates, therefore the rendering is always pixel perfect with no blurring/filtering going on. Is it possible to add a mode where we get blurred filtering? So basically, allow X/Y coordinates in fractions, so something like (38.2, 40.5) would be rendered blurry because of filtering instead of rounded to (38, 41). If I remember correctly though, the proper way to tell the browser to n[list=]ot round the coordinates does differ depending on which one you are targeting, ranging from using CSS transform/translate, setting the CSS position, drawing on canvas, etc. The reason to request this is that let's say you are building a 30fps game or experience, you will usually turn on subpixel filtering for a smoother experience. The images will be blurrier, but that prevents the sort of stuttering you see in the animation, and I think it's a more representative comparison of what the user will actually experience in 30 vs 60fps for normal apps. In my experience, filtering only helps microstutter by half a pixel maximum -- but yes, it is useful. You can already simulate filtered by adjusting Browser Zoom -- 50%, 75%, 110%, 200%, etc while viewing http://www.testufo.com. Or view TestUFO on an iPad and pinch-zoom on an iPad. This will create the filtered effect. Even patterns like http://www.testufo.com/eyetracking and http://www.testufo.com/blackframes works fine at 50% browser zoom and 200% browser zoom, showing subpixel scaling doesn't interfere with the science of motion blur very much (except for things like aliasing/filtering side effects). Observe that (when animations are properly synchronized) the stutter looks essentially unchanged for the most part. Subpixel filtering errors doesn't even interfere with Blur Busters Law much, except adds an error margin of only ~0.5 pixel (or whatever blur-size is used), regardless of how many pixels of motion blurring there is. However, improvements from subpixel filtering is especially very noticeable at slow motion speeds where single-pixel microstutter can easily be seen. So optional subpixel speeds is a GREAT idea for MANY reasons! It is a great demonstration of how subpixel speeds can reduce single-pixel microstutter, even if it's applied to only 1 TestUFO test, or as an undocumented setting (for custom pixel speeds that are refresh-rate-independent). (A) Add custom motion speed for all possible pixel rates (1 pixel increments) by using subpixel filtering, to at least one of the TestUFO tests. (B) Add a two-UFO custom motion speed "versus" comparison between pixel-rounding (single-pixel microstutter effect) versus subpixel-filtering (smooth), e.g. demonstrating things like how smooth 831 pixels/second can be at all refresh rates when using subpixel filtering. Preferred selectable options: Custom motion speed textbox, select a couple of different graphics (UFO or etc), etc. If you're talking about motion blur pictures, see Motion Blur Reduction FAQ as well as Reviewers Using Pursuit Camera (it's a real thing). Feel free to ask questions; or post a new thread to ask questions! This requires the customization ability for the background to be changed from black to other colours lets say the same colour which are available from ghosting test. This will allow users to see ghosting alongside black frame insertion test for any kind of ghosting increase or decrease right away as well together thus people wanting to see the ghosting being affected by black frame insertion. It is good in my opinion to be allowed as customization. Background color option for blackframes test. I have a suggestion for adding a toggle for motion blur to the standard FPS comparison test. This comes up in those "classic" discussions about people "not being able to see past 30FPS". The argument is that if you add motion blur to 30FPS, it can look as good as 60FPS. There is some merit to that, at least when it comes to motion smoothness. 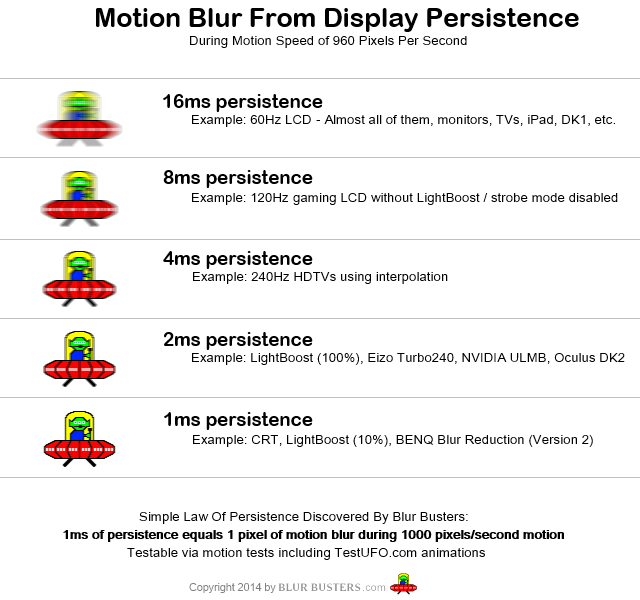 Motion clarity is thrown out the window, of course, but perceived motion smoothness indeed increases a lot when adding motion blur, especially high quality motion blur. I've been fooled quite a few times by 30FPS videos on youtube, where I thought they were 60FPS. However, my argument is that if you do the same to 60FPS, it will still look smoother, closer to 120FPS, and if you don't add blur to 60FPS, it still looks much clearer than 30FPS with HQ blur. But comparing 30FPS with motion to 60FPS without motion blur would really bring the point across that smoothness is not the only consideration. Clarity is also important. So even though if 30FPS with HQ blur looks closer to 60FPS without blur in smoothness, it doesn't look even remotely close in motion clarity. So a comparison between these two would be a nice demo to have. Implementing high quality motion blur in JS is probably a lot to ask for though, unless you can fake it with some pre-rendered motion blur bitmap, since the UFO is always the same. RealNC wrote: Implementing high quality motion blur in JS is probably a lot to ask for though, unless you can fake it with some pre-rendered motion blur bitmap, since the UFO is always the same. That's an idea I've already got planned. I have to initially generate that bitmap dynamically because blur-matching a lower frame rate will be framerate & Hz dependant. But once generated, it's the same bitmap reused. I want to replicate the old PixPerAn preblurred static image feature too someday (although in a simplified way). 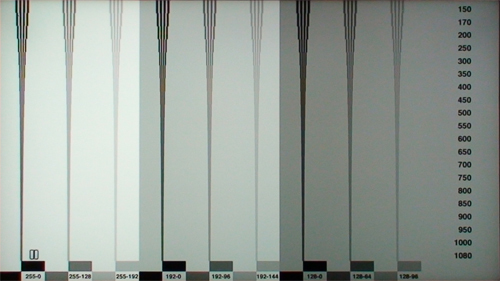 May I suggest a test pattern which can be used to measure motion resolution. The pattern scrolls horizontally and wherever you can see interline contrast up to in the converging lines, is the amount of motion resolution you have. pneu wrote: May I suggest a test pattern which can be used to measure motion resolution. It is a discussion that has some interesting spinoffs!